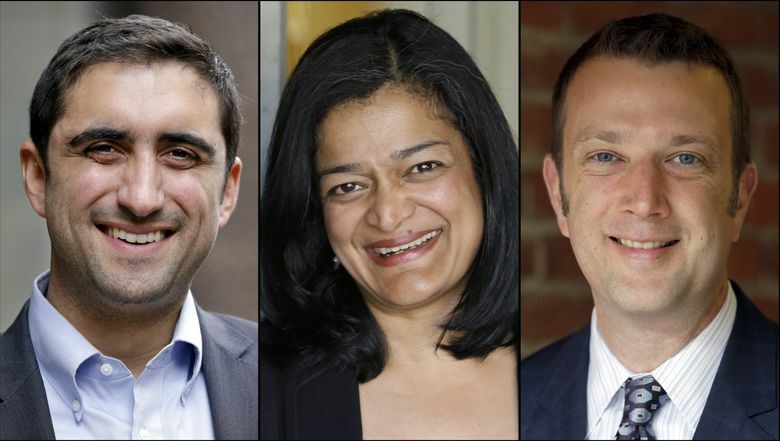 Pramila Jayapal took a commanding lead in Tuesday’s vote count in the 7th Congressional District race, with Brady Walkinshaw and Joe McDermott neck and neck behind her. Pramila Jayapal took a commanding lead in Tuesday’s vote count in the race to replace retiring Rep. Jim McDermott in Washington’s 7th Congressional District seat. Jayapal had 38 percent of the vote and will advance to the November general election. Joe McDermott and Brady Walkinshaw were neck and neck behind Jayapal, McDermott with 21.5 percent and Walkinshaw with 20.9 percent. The top two vote-getters will move on to the fall election after all of the votes are counted and final results are certified in about two weeks. “We’re building a movement that can clearly stake out a positive vision for the future of America at a time when too many people feel cynical about change, and when too many people are struggling to make ends meet and put food on the table,” Jayapal said Tuesday night. With their battle too close to call, Joe McDermott and Walkinshaw both said they’re looking forward to taking on Jayapal in November. Six other candidates — Democrats Arun Jhaveri and Donovan Rivers, Republicans Scott Sutherland and Craig Keller, and independents Leslie Regier and Carl Cooper — each had no more than 9 percent of the vote. The 7th District includes most of Seattle, Vashon Island, some southwest suburbs of King County and a sliver of Snohomish County. State Rep. Walkinshaw declared first, in December, before Jim McDermott announced he would retire. The 32-year-old Capitol Hill resident, who worked for the Gates Foundation before being appointed to office in 2013, emphasized his rural upbringing in Whatcom County, his Cuban-American heritage, his commitment to combat climate change, and bipartisan work in Olympia on mental-health treatment and criminal-justice reform, among other issues. “Although the outcome of this race remains undetermined, I am honored to have the support of so many voters in this community,” Walkinshaw said Tuesday. Metropolitan King County Council member Joe McDermott, a 49-year-old West Seattle resident, has described himself as the race’s most experienced lawmaker, with 15 years as a state representative, state senator and County Council member. The Sound Transit board member identified gun responsibility and campaign-finance reform as major priorities. State Sen. Jayapal, 50, has raised more money and racked up more endorsements than her opponents, including Sen. Bernie Sanders. The Columbia City resident, a Wall Street financial analyst turned immigration- and voting-rights activist, has vowed to be progressive Seattle’s “bold voice” in Washington, D.C., pushing for racial justice, debt-free college and equal pay for women. Jim McDermott, a 14-term congressman, hasn’t endorsed in this year’s race. Ten-term incumbent Congressman Adam Smith, a Democrat whose 9th District stretches from South Seattle to Tacoma and includes Bellevue and Mercer Island, was easily outdistancing his opponents. Smith had 57 percent of the vote while Republican Doug Basler, challenging Smith for the second time, was second with 25 percent. Jesse Wineberry, a former state legislator who had the support of many of the district’s black clergy, was third with 13 percent. In the 1st District, which stretches from Redmond to the Canadian border, incumbent Democrat Suzan DelBene was well ahead of challengers with 54 percent. Republican Robert Sutherland was second with 31 percent. In the 2nd District, which includes Everett, Whidbey Island and the San Juan Islands, Democrat Rick Larsen, seeking his ninth term in Congress, was outdistancing the second-place finisher, Republican Marc Hennemann, 53 percent to 32 percent. In the 8th District, which encompasses Southeast King County to Wenatchee, incumbent Republican Dave Reichert was leading Democrat Tony Ventrella, a former TV sportscaster, who dropped out of the race in May but still appeared on the ballot. Reichert received 57 percent to Ventrella’s 17 percent, with Democrat Santiago Ramos third with 13 percent. In the 3rd Congressional District in Southwest Washington, Incumbent Republican Jaime Herrera Beutler was being challenged by several Democrats, including Jim Moeller, who appeared poised to move on to the general election with 26 percent of the vote to Herrera Beutler’s 54 percent. The 4th District in Central Washington was heading toward a reprise of 2014, with first-term Republican Dan Newhouse again being challenged by former professional football player and Christian radio host Clint Didier. Newhouse picked up 46 percent of the primary vote while Didier, also a Republican, received 27 percent. Democrat Doug McKinley also remained in the running with 22 percent. Incumbent Cathy McMorris Rodgers, the highest-ranking Republican woman in the U.S. House, was ahead of Democratic challenger Joe Pakootas in the race for the 5th District Congressional seat in Eastern Washington with 41 percent of the vote to 32 percent. In the 6th District, Democratic incumbent Derek Kilmer was leading five lesser-known challengers. He had 57 percent of the vote. In November, he’ll face Republican Todd Bloom, who picked up 24 percent.